Murder by Gaslight: The Medford Mystery. Scene of the Debbins murder. 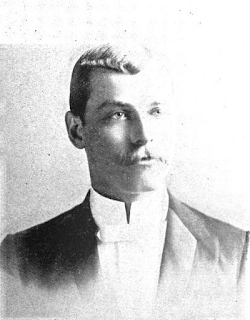 Walter R. Debbins was shot twice in the back, in broad daylight, on Highland Street in Medford, Massachusetts, on the afternoon of Saturday, March 27, 1897. Though no one saw the murder or heard the gunshots, there was enough traffic on Highland Street that afternoon for the police to precisely pinpoint the time of the shooting to between 1:00 and 1:05. But that was all they could pinpoint; everything else about the crime was shrouded in mystery that grew more dense with each new revelation. Twenty-one-year-old, Walter Debbins was on his way to the home of his friend, Franklin W. Wood. They had probably planned to spend the day walking in the woods near the Stoneham pumping station as they often did, sometimes accompanied by their friend, Charles Smith. This day, their signals were crossed; Woods went to Debbins’s house, arriving there shortly after Debbins left for his house. He know the route Debbins would take, and he hurried after. When he reached Highland Street he saw several people gathered around a dead body lying on the ground. It was Walter Debbins; they believed he had died of heart failure. Two boys on bicycles had ridden off to tell the police. Woods took of his coat and ran back to Debbins’s house to tell his mother. When the coroner examined the body, he discovered that Walter Debbins had been shot twice in the back. He removed two .38 caliber slugs, one from the heart and one just below the shoulder blade. 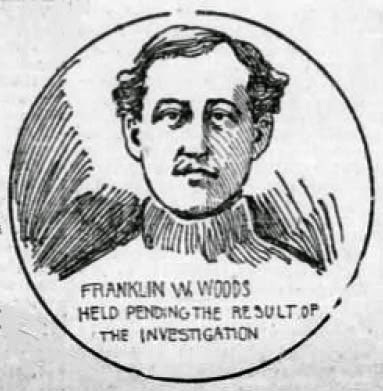 Franklin Woods was arrested on suspicion. Though there was no evidence against him, the police felt he had a connection to the murder and held him as a precaution. 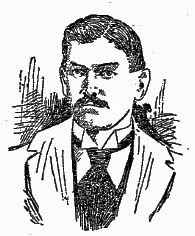 It was well known that Walter Debbins was the sweetheart of Miss Mary Hook, and the police first thought that Franklin Woods may have murdered his friend out of jealousy, but there was no evidence that Woods had any feelings for Mary Hook. Debbins and Woods had been close friends since childhood and were not likely to let a girl come between them. Both men were unemployed at the time of the murder and had been spending all of their free time together. Franklin’s brother John told the Boston Herald, “My brother Frank could not possibly have any motive in killing his best and only chum.” Franklin Woods was released from custody. Finding a motive for the murder of Walter Debbins was a daunting problem for the police. Debbins’s gold watch and a signet ring had been taken by the killer but they ruled out robbery as a motive. Given the circumstances, revenge seemed more likely, but Debbins was an easy going young man, with no known enemies. If he had only been shot once, the police would likely have considered it an accident, a stray bullet from a hunter or target shooter, but two shots made it murder. Someone had intentionally killed Walter Debbins. His romantic attachment to Mary Hook was the only controversy in Debbins’s life; she was five years younger than he was and her family did not approve of the relationship. Several months earlier, her mother had forbidden them from seeing each other, and it appeared that Debbins had complied. Mary’s brother, Frank, held a grudge over the relationship, but, like Wood, he had grown up with Walter Debbins and still considered him a friend. Besides, it appeared that Mary Hook was pursuing Debbins and was more fond of him than he was of her. 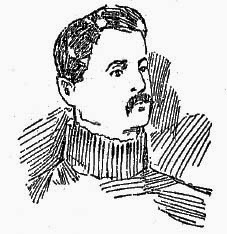 The Boston Post reported, “Among Debbins's friends he seems to have borne the reputation of being not a woman hater exactly, yet not especially fond of the company of ladies.” The police rejected the romance as a motive. Walter Debbins’s friend Charles S. Smith, Jr. told the police about in incident involving Debbins and a group of Italian laborers who had been working on repairs to the pumping station. Smith and Debbins had been drinking with the Italian men in their camp near the water works and Debbins accidently broke an accordion belonging to one of the men. The man threatened to kill Debbins. Another story surfaced involving Debbins and the Italians. A man named Vincent Salamone was arrested for illegally selling beer at the camp, and it was alleged that Walter Debbins had informed on him to the police. Salamone was not held for the crime and the police had no record of Debbins as the informant. Both of these incidents occurred a year and a half before the shooting and neither was deemed significant enough to incite murder. The Italian theory was rejected, though it did prompt the citizens of Medford to report sightings of suspicious Italians all over town. The City Council of Medford offered a reward of $500 for information leading to the arrest of Debbins’s killer, and the police received much new information. However, the case was growing cold and at this point it was hard to distinguish between real clues, coincidences, and tips that were totally irrelevant. A bloodhound was tried at the murder scene, but a week after the murder there was no trail to follow. Two carpenters who had been working about a mile, through the woods, from the scene, reported hearing gunshots around 1:00 on the day of the murder. The police conducted an experiment to see if it was possible to hear gunfire from that far away, and concluded that it was not. Most likely the men heard shots from a man who seen doing target practice in the woods with a .42 caliber Winchester rifle—the bullets that killed Debbins were .38 caliber. The police were now specifically looking for two persons of interest, who were known to be near the murder scene that day. The first was an unidentified man who had been seen riding a bicycle down Highland Street about ten minutes before the body was found; the press referred to him as the “Lone Cyclist.” He stopped to chat with the manager of the LongWoods Hotel, before continuing down the road. The timing was such that he would have seen the killer, if he was not the killer himself. The second suspect was a dark haired stranger wearing a dark coat who had been seen by Johnny Doherty, a boy who had been riding in a wagon with a peddler named Hugh Reynolds. Reynolds and Doherty were the first to see the body at about 1:10 pm, and Doherty had seen the stranger on the road. A man who fit the description Doherty gave had been seen around 10:00 that morning, by A. W. Patterson, a fish store owner in Charlestown, a Boston neighborhood about 4 miles southeast of Medford. The man had dark hair and a sandy mustache, wore a black derby, and a black overcoat with a velvet collar. He said he needed money and tried to sell Patterson a .38 caliber revolver. When Patterson declined, the man asked directions to the road to Stoneham, a town bordering Dedham. The man—called the “Slick Stranger” by the Boston Herald— was next seen at about 11:45 by a stable owner in Dorchester. He had gone to several stables there to ask about employment. But if he was on his way to Stoneham he was heading in the wrong direction; Dorchester is about eight miles south of Charlestown. He was seen again by Edwin Myers, at about noon, on Highland Street in Medford, when he asked Myers how to get to Lawrence. Myers said he couldn’t tell him how to get to Lawrence but told him he was on the road to Stoneham. The man thanked him and said when he reached Stoneham he would know the way. Myers said the man struck him as someone who had gone to Boston for a good time and had no money left to get home. On April 2, the police received an anonymous letter, purporting to be from the Lone Cyclist. He said on the day of the murder he rode past two men who appeared to be wrestling for fun and he stopped to watch the sport. When the man on top saw the Cyclist he picked up a revolver from the ground, turned to him and asked where in hell he came from. He was too frightened to respond. Then the man asked if the Cyclist knew what was wrong with the man on the ground. He said, “No.” and the man with the gun said “You don’t want to know either.” And followed with a string of epithets too profane to print in the newspaper. The Lone Cyclist then rode away, chased by the man with the revolver, who fired one shot at him. He refused to give his name to the police, for fear that he would be arrested for murder, or that the real murderer would find him and kill him. 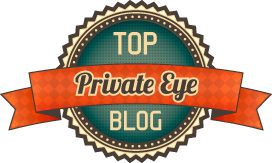 The first Friday evening after the murder, a man was seen in the woods near the murder scene, wearing nothing but a short undershirt. He had one foot on a stone from an old wall and had one arm outstretched, index finger pointing to the sky. The police were notified, and fifteen officers were summoned to search the woods for the “lunatic or erratic stranger” who the Boston Herald was calling “the man in the ‘altogether.’” They had no luck. The Slick Stranger was seen again, this time in a Lowell, Massachusetts pawn shop. He matched the descriptions in the newspaper and was there to pawn his pistol, a .32 caliber revolver—once again, the wrong caliber. The following day, a man fitting the description of the Slick Stanger was arrested in Lawrence, and held for the Medford authorities. Sergeant Wells took Edward Myers to Lawrence to see if this was the man he had seen the day of the murder. It turned out he was not the Slick Stranger, but a man named Richard Donovan, who was well known by the Medford police and had already been rejected as a suspect. There were other sightings of the Slick Stranger in Lowell and Lawrence, but the Medford police were now convinced that he had fled in the other direction and gone back to Boston. As each new clue proved false, it became more apparent that the Debbins murder would probably never by solved, and gradually the story disappeared from the newspapers. 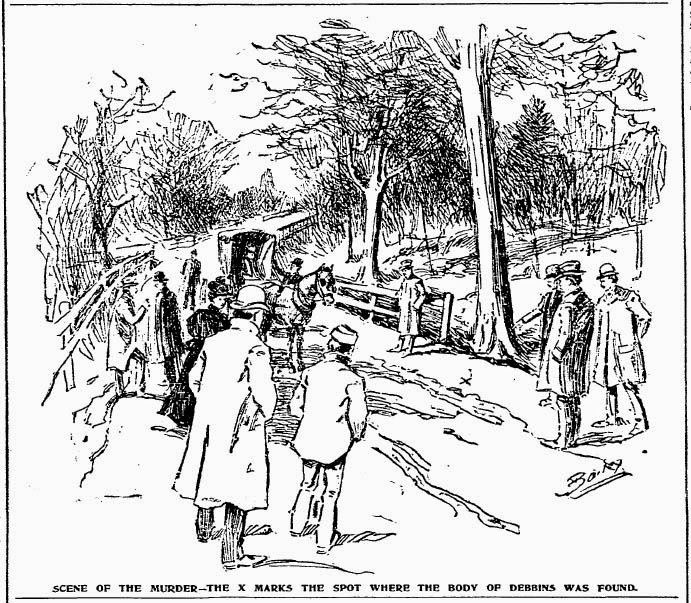 Then on April 18, the body of an unknown African-American man, with two bullets in his head, was found in the woods in Winchester, near the Medford line, two and a half miles from where Debbins was killed. Rumors circulated in Medford that this murder was connected to Debbins’s murder, but nothing was substantiated. It was never determined whether or not the two deaths were part of the same Medford mystery. The murder of Walter Debbins faded into the shadows again until the following February when another death recalled it. Eleven months to the day after the murder of Walter Debbins, the body of Charles S. Smith, Jr., one of Debbins’s closest friends, was found hanging from the limb of a tree about 500 yards from his house. He had committed suicide. Of course, a rumor began to circulate in Medford that Smith’s death was connected to the murder of Walter Debbins. It was said that he had left a letter implicating himself and Frank Woods in the crime. The chief of police denied that any letter had been found either on Smith’s person or in his house. He denied any connection between Smith’s suicide and Debbins’s murder, saying that Smith “suffered from mental trouble.” The mystery endures. In reading this case more than a hundred years later, one is left with the impression that more was going in the lives of these young men than was being reported, and that the woods off Highland Street were something more than a pleasant place to stroll. While it is fairly certain that the police never learned the identity of Walter Debbins’s killer, it is possible that they did not tell all that they knew, for the sake of those still alive. In any case, the motive for Walter Debbins’s murder is still unknown and the Medford Mystery will remain forever unsolved. "A Mystery to Unravel." Boston Herald 29 Mar 1897: 1. "Another Clew." Boston Herald 9 Apr 1897. "A Poor Witness." Boston Herald 3 Apr 1897. "Hard to Solve." Boston Herald 7 Apr 1897: 2. "Man on Bicycle." Boston Herald 30 Mar 1897: 4. "Medford Mystery Solved." Boston Herald 28 Feb 1898. "Medford's Mystery." Boston Post 29 Mar 1897. "Murderer of Debbins." Boston Herald 6 Apr 1897. "Slick Stranger Traced.." Boston Herald 5 Apr 1897: 1. "The Mystery Deepens." Boston Post 31 Mar 1897. "Tried to Sell Revolver." Boston Herald 4 Apr 1897: 1. "Two Bullets in his head." Boston Herald 19 Apr 1897. "Vain Search for Clues." Boston Post 30 Mar 1897: 1. "Was Murdered." Boston Post 28 Mar 1897: 1. "Woods is Free." Boston Journal 29 Mar 1897. The killer must have been very confident that they would not get caught by shooting Debbins in the middle of a street in broad daylight.